The disciples are in a fog. Each of them has decided to follow Jesus; but they’re still not sure who he is. Sure, there have been signs along the way. There are rumors about Jesus’ baptism. They say that a voice came from heaven: “You are my Son, the Beloved; with you I am well pleased.” And other things have happened, too. Once, Jesus stilled a storm. Twice he fed enormous numbers of people with very small amounts of food. Several unclean spirits in Capernaum and Galilee have recognized Jesus as the Holy one of God; as the Son of God. And Jesus has performed countless miracles of healing. But who can really tell? Not all the signs point to “Messiah.” There is room for reasonable doubt. After all, Jesus eats with tax collectors and sinners – hardly a holy thing to do. He fails to strictly observe Jewish law, flaunting God’s instructions. And he listens with humility to the rebuke of a Syrophoenician woman. Why would a Messiah do that? The disciples are in a fog. They’ve heard and seen and experienced signs about who Jesus is, but they’re not ready to draw any conclusions. In this gospel reading, Jesus puts an end to all the speculation. It should be a wonderful moment for the movement. The disciples are finally getting a real answer from Jesus himself; and the answer is so good that it’s hard to believe. Jesus is not just a great prophet, as so many thought, but is truly the Messiah, the anointed one of God. The Messiah, according to the wisdom of the time, was the one who would make Israel supreme among the nations and bring about a new time of peace and holiness. It should be a wonderful moment for the movement. But it turns out that this moment of revelation is more of a good news/bad news situation. As soon as Jesus raises their hopes, he dashes them again, totally redefining their idea of what a Messiah is, what a Messiah does, and what it means to follow a Messiah. Can you imagine the hush that came over the crowd? This good news is also bad news – really bad news — not only for Jesus, but for everyone who follows him. Last Spring, another leader came out with a big pronouncement. You may have forgotten, so much has happened since June. But Pope Francis released an encyclical, a teaching titled “Laudato Si”: On Care for our Common Home. This encyclical was directed not only to the worldwide Catholic Church, but to all who share Francis’ concern for our earth. Unlike Jesus, Francis starts with the bad news. In Laudato Si, he speaks out about the signs of widespread environmental damage: climate change, freshwater depletion, the loss of biodiversity. But the damage isn’t limited to weather and our waters, to plants and animals, he argues. There is a human cost, too. Francis describes cities where pollution and isolation from nature particularly affect the poor and powerless. He also writes about how environmental deterioration disproportionately influences the most vulnerable on a global scale: fishing communities affected by lack of fish; those who cannot afford bottled water where fresh water has become unsafe; impoverished coastal residents who lose their homes with rising waves. Bad news. And the news gets worse: Francis reminds us we have no one but ourselves to blame for the damage we see around us. It is our modern economies that have caused this, focusing on short-term human profit rather than long-term natural health. And people of faith are definitely part of the problem. We have failed to speak out against a way of life that prioritizes the pleasure of a few people of wealth over the survival of a whole world of human and natural communities. Pope Francis made a powerful pronouncement. It was full of bad news. Of course, none of it was really news, because it wasn’t new; but it made the news anyway — maybe because too many of us have been burying our heads in the sand or keeping our fingers in our ears, failling to accept the truth about environmental damage. Maybe because too few faith leaders have made a big enough stink, making it clear that this is a moral issue. We’ve been in a fog; seeing and hearing the signs but unwilling to accept where all this is headed. Pope Francis spoke up about the bad news. But is this a bad news/good news situation? Here’s one piece of good news: our faith teaches us that we are intended for something better. All the earth, and everything that fills it, comes from a Creator who makes us with love and calls us good. 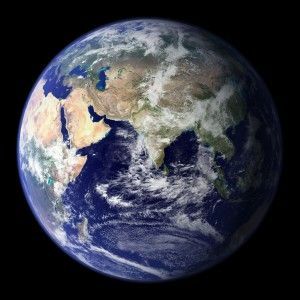 What’s more, that Creator has given us human beings a task – all the way back in the book of Genesis and many times since – to be stewards of this great big beautiful world. We are the ones who can mend the web so that, as we hear God say in Genesis (8:22) the earth will endure; seedtime and harvest, cold and heat, summer and winter, day and night, will not cease. And here’s another piece of good news: our faith is one of resurrection. Yes, we have failed to be competent stewards, and the earth and our fellow human beings have suffered greatly because of it. But at the center of our faith is a story of life after death. At the center of our faith is a belief in rising up from disaster, in the magnificent ultimate victory of life and love. Like the disciples, we have been in a fog. And Francis is just one of the voices calling us to truly see and hear and know the truth: that we have harmed our fellow humans and the natural world; and that we have the responsibility, and the capacity, to begin the healing. Of course there are plenty of folks rebuking Francis, like Peter rebuked Jesus. There are those who still unbelievably argue that nothing is wrong with our planet. And there are those who see only disaster ahead. But we must reject these voices, from within and from without. The way of discipleship in this time of crisis is a challenging path. We must deny ourselves the lifestyle we have become accustomed to. We must lose our habits of convenience, and apathy, and profit. Each of us has work to do as individuals to discern how we can best pray and speak and act to be faithful to our call. And I hope we will do some work together as well. We need your help if we’re going to transform the way we use energy in this building; or if we’re going to build a powerful movement for change in this congregation. There’s a chance to start, right after worship. In such a time as this, what kind of disciples will we be? What will it profit us to gain the whole world and forfeit the lives of the poor, all natural life, the lives of our children and grandchildren? Jesus, your message frightens us. We wish we could turn away from the tragedy all around us. We wish we could ignore the consequences of our way of life.Grant us courage to accept the truth, to mourn the losses, to ask for forgiveness. Teach us how to rid ourselves of the life we have known in order to save our own lives, and the lives of so many others. Remind us that you made us and called us good, and that we may yet be good stewards of your marvelous creation. Remind us that after suffering and death, you rose in glory; and that the story of our earth may be one of resurrection, too. Amen.